There’s one or two urbex books being published by mainstream publishers (there’s an awful lot being self-published on Blurb), the most notable being the superb Abandoned Places by Henk van Rensbergen, which I posted a review of last year. Forbidden Places is very much in the same vein. 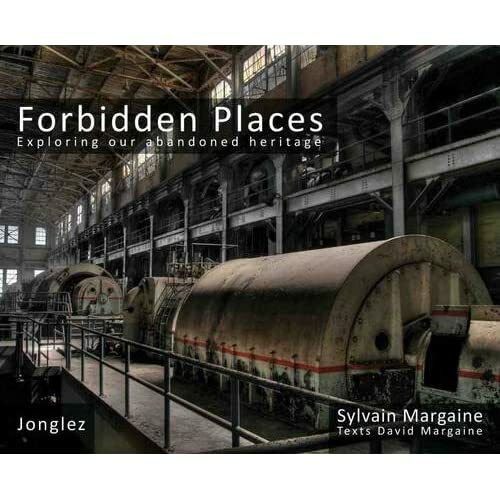 The book is by Sylvain Margaine, who runs the website www.forbidden-places.net which I highly recommend. The site is excellent, similar in format to my own, with photo galleries and extensive histories of the locations visited. I must admit to being slightly disappointed by the book though. It’s a substantial thing, with over 250 pages and covers 40 sites across Europe and the USA . My main issue is with the production and the editting – a lot of the colour photos look desaturated to just short of being monochrome, while on some pages there is a mix of colour, toned and monochrome. Sorry, that just doesn’t work in my opinion. In addition, the formatting of the text is just random. Finally, to my eyes, there’s too many sites covered. I’d like to have seen maybe 25 done really well as some of the sites aren’t really worthy of inclusion. By way of comparison, Abandoned Places has only 15 sites, but with at least 7 photos per site, and no more than 2 photos per page. While it would have been easy just to have done a clone of Abandoned Places, I really don’t think that whoever produced Forbidden Places has done themself any favours with the layout or structure of the book. That’s the negatives out of the way, now the positives – covering so many sites has resulted in a lot of variety – hospitals, asylums, steelworks, powerplants, hotels, railway stations, underground, and the standard of photography varies from good to excellent. My personal favourites are Clabecq Steelworks, Hudson River Hospital and Cane Hill, all huge sites that I’d love to have seen more of. At £30, the price seems steep, but I managed to get it for £20 on Amazon. I’d have thought £25 is a more realistic price for it, buthaving said that you are getting a lot of book for the money. In summary, I’d say it’s a good book and I’d recommend it to anyone interested in the genre, but when you put it side by side with Abandoned Places, it starts to look a bit thrown together, and that really is the responsibility of the publishers to have sorted that out before it went to press. But all credit to Sylvain for getting the book published! Click the picture below to go to Amazon to buy it!